Making a comeback from its sell out run at the 2014 SummerWorks Festival, Madam Mao provides audiences with the chance to delve into the mind of one of the 20th Century’s lesser known political figures with powerful performances and a challenging script. As a westerner whose education of China’s history basically consists of the Romance of the Three Kingdoms, Madam Mao is one of those plays that leaves me feeling a little unsure of how to look at it from a historical perspective. Madam Mao focuses on the titular figure of Madam Mao (more accurately Jiang Qing, wife of Chairman Mao Zedong), one of the major architects of the Cultural Revolution and a woman responsible for hundreds of thousands of deaths in pursuit of a philosophically pure Revolutionary China. 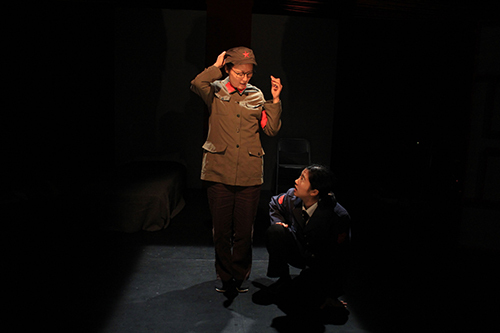 Ousted from power and a political prisoner, the play explores Jiang Qing’s life and politics from her perspective as a young Sergeant tries to exact a public confession for her crimes. I’ve had my experiences in the past reviewing plays about less than noble historical figures and it can be very tempting to simply vilify the subject matter and turn productions into lectures or diatribes. One of the things I really appreciated about Madam Mao was that while it made no attempts to excuse Jiang Qing’s actions, it doesn’t portray her as a mustache twirling villain either. Janet Lo paints the picture of an idealistic woman whose desire for power and revolutionary fervor led to casual atrocities in the name of the greater good. It’s a challenging and sobering performance that regularly had me questioning whether Jiang Qing was the monster history has portrayed her as (when it mentions her at all). Fleshing out the production, Azure River includes a variety of Revolutionary era music and film clips along with dance sequences recreating some of Jiang Qing’s Model Plays. I personally really enjoyed these as I have an interest in propaganda and seeing how the plays blended art with Communist rhetoric was fascinating. It certainly didn’t hurt that both Samantha Wan (as the Sergeant and Trickster) and Amanda Zhou (as the Red Guard) are talented dancers and actors, able to convey the emotional message of the pieces merely through movement and Janet Lo’s narration. As I said, for all that I enjoyed Madam Mao I’m not entirely sure how to approach it historically. Until I saw the play I had never even heard of Jiang Qing and it is entirely possible that the moral ambiguity I felt wouldn’t be as noticeable for someone who understands the full context of China’s history and the Cultural Revolution. Nevertheless, the fact I learned something and despite my ignorance was still able to comprehend the monstrous place Jiang Qing holds in history shows how well thought out the script is, and how worthwhile seeing this show is no matter your knowledge of the subject.